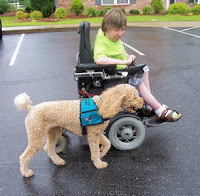 Think of a service animal as an animal with a job to do for a person with a disability. Most associate a service dog with someone who is blind. A service dog that has been trained as a guide for a blind person at one of the facilities listed in Ontario Regulation 58 under the Blind Persons’ Rights Act Service is more commonly named a “guide” dog. Animals can also be employed by people with autism or other developmental/intellectual disabilities, mental-health disabilities, physical disabilities, epilepsy or seizure disorders, and by people who are deaf or hard of hearing. The Customer Service Standard states that you must have a policy in place to allow people with disabilities to be accompanied by their guide dog or service animal in areas of your business that are open to the public. Where a law excludes an animal from your premises, explain why the animal is excluded and explore or discuss with your customer another way of providing service. Not all service animals wear special collars or harnesses. If you’re not sure if the animal is a pet or a service animal, do not be afraid to ask your customer. If it is not obvious that the animal is a service animal, you are not required to allow the animal on your premises if the person does not have a letter from a physician or nurse, or an identification card from the Ministry of the Attorney General. Do not touch or address service animals – they are working and have to pay attention at all times. You should anticipate situations that may require special instructions. Some examples may include when you are serving two customers, one of whom uses a service animal, and another who has an allergy to animals or when you have a policy on pets. It is difficult to anticipate the needs of all customers. However, learning about the experiences of customers with various disabilities and the barriers they face will help you to anticipate their needs and to offer accessible services. Consider people with a vision loss, for example. Very few people are totally blind. Many have limited vision such as tunnel vision, where a person has a loss of peripheral or side vision, or a lack of central vision, which means they cannot see straight ahead. Some can see the outline of objects while others can see the direction of light. Vision loss can result in difficulty reading or seeing faces, difficulty maneuvering in unfamiliar places, the inability to differentiate colours or distances, a narrow field of vision, the need for bright light, or contrast or night blindness. In some cases, it may be difficult to tell if a person has a vision disability. This is but one example of a disability that illustrates varying levels of ability and the different barriers people may face.